High power interferometer for low reflectivity setups. 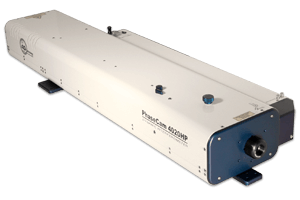 The PhaseCam® 4020HP dynamic high power interferometer includes a 20 mW HeNe laser source for low reflectivity (<1%) measurement setups, such as measuring aspheres using Computer Generated Holograms (CGHs). The PhaseCam 4020HP incorporates a single camera, high-speed optical phase sensor that makes a wavefront measurement in as little as 30 microseconds—5000 times faster than a temporal phase shifting interferometer. Because acquisition time is so short, the PhaseCam high power interferometer can be used without vibration isolation, making it ideally suited for metrology on the production floor, in cleanrooms and in environmental test chambers.